Successfully Added VGA to Home Video Convertor Box - PC to TV Connection to your Shopping Cart. 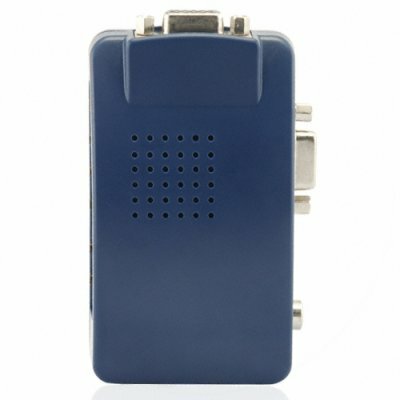 Computer video/VGA to TV converter box. Want to surf the internet on your new big screen 42" TV or want to share your holiday digital photos with your friends? Here is your answer; the CVSBA-6901 computer video converter box. Now you can easily send your computer video signal to the TV. Simply plug in the computer VGA output cable into one end of the converter box and attach the appropriate video cable (three standard types are provided in the box!) into the other end and you are ready to rock. Great for both business and personal use, and can work with any type of video display such as LCD, Plasma or CRT. Another great digital accessory brought to you at Chinavasion's usual rock bottom wholesale prices. Easily sell this to your internet store/EBay customers for great profits and take advantage of Chinavasion's drop shipping to maximize your limited resource of time.